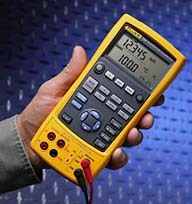 Designed for process instruments technicians, Fluke 724 temperature calibrator offers measure and source functions for most temperature sensors and transmitters in the plant.This calibrator can measure and source 10 thermocouple types and 7 RTD types, plus volts and ohms. The dual line measure/source display allows the user to source temperature and view loop current at the same time. Power transmission during test with a loop supply is simultaneous with mA measurement. Fluke Corporation, 6920 Seaway Blvd., P.O. Box 9090, Everett, WA 98206. Tel: 425-347-6100; Fax: 425-356-5116.